Put the dates and water in a microwave-safe container and cook for 4 minutes. Then simply puree using a hand blender (ziiiiiiip! ziiiiiiip!) until you get a Greek yogurt like consistency. And presto! 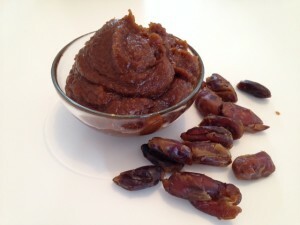 There you have it, your very own delicious Labriski date puree! Storage: 2 to 3 weeks in the fridge in an airtight container and up to 3 months in the freezer.